Barn doors are not just for barns, from the countryside these wide sliding doors have entered modern houses to become popular interior decor pieces. From cosy hide away bedrooms to rustic home office doors and unique wardrobe solutions, the Frontier sliding system is the perfect room divider. Inspired by the elegant, coastal charm of the Hamptons, the Hampton Collection of doors is relaxed, coastal and quaint. Raw and natural lines conspire to give a "permanently on holiday" feel. The door construction is polyurethane core, pre-primed face material with the rails & stiles made of laminated timber. Standard sizes of 2040 x 520/620/720/770/820 x 35mm, weighing 30kg (based on 2040 x 820 x 35mm door). This range of solid timber doors made from Pacific Oak includes the traditional 4 panel and federation style doors. Available unglazed or with a range of glasses of your choice. Solid timber doors with engineered flat panels. These doors feature either a traditional stepped mould (DR630 and DR631), typical of the Edwardian and Art Deco eras, or a distinctive insertion mould (DR600, DR609V and DR611) found in Victorian and Edwardian style homes. Whether you are restoring or replicating, these doors achieve the authentic appearance of the doors from these eras. A range of classic glazed doors that can be provided unglazed or with a glass of your choice. Standard 1 Lites come with 6.38 mm clear laminate, 5 mm tempered (toughened) glass or 6.38 mm white translucent laminate. Standard 10 Lite and 5 Lite doors come with 5mm clear bevel. 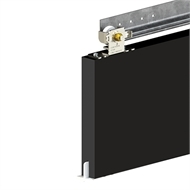 ​An entry level top-hung system designed for single internal doors or in a wall mount application. The open 'J' track design allows for easy installation. ​The Evolution Touch is magnetised & will hold your door firmly open inside the caivty. The soft one touch action spring loaded release system is effortless. Simply push the edge of the door to release from the cavity.